$298. (available April 2018) The Combo water slide provides a misting hose above the slide that refreshes participants all the way down the slide. 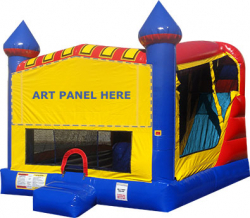 This 4 in one combo also has a basketball goal and bouncing area along with the ladder and slide all inside!